M4V to DVD: How to convert M4V to DVD, burn M4V to DVD? How to convert M4V to DVD and burn M4V to DVD? Xilisoft DVD Creator for Mac is an easy-to-use Mac DVD creator and Mac DVD burner program which can help Mac users convert M4V files to DVD format and burn M4V files to DVD disc directly. It can not only convert and burn M4V to DVD, but also convert and burn other popular video formats such as AVI, MPEG, WMV, 3GP, MP4, etc. to DVD. You can also customize DVD menu/soundtracks/subtitles, edit video effect and clip video to burn DVD movie. Free download to have a try first. 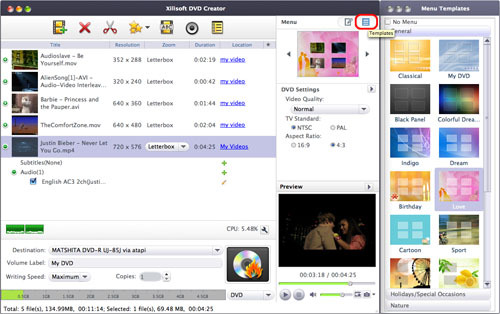 If you are Windows user, please visit: Xilisoft DVD Creator for Windows. Step 1: Download the DVD Creator for Mac (Please choose Intel Version or PowerPC Version) and install it. Step 2: Insert a DVD disc. Insert a blank or rewritable disc into your recordable drive: DVD-5 or DVD-9. Step 3: Load M4V files. Click "Load Video Files" button to load your M4V files. Step 4: Set output display method. Step 5: Make DVD menu. Click "Template" to choose menu you like. Edit "Background Music", "Background picture" and "Menu Topic". You can choose to convert and burn M4V files to DVD disc directly or convert M4V to DVD folder and ISO files. Step 8: Click "Start Burn" to convert and burn M4V to DVD. If you're interested in this program, please visit: Xilisoft DVD Creator for Mac.